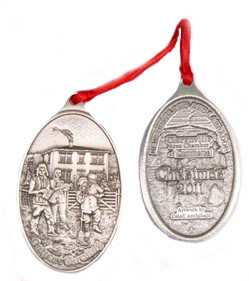 Beginning in 1999, the Clarenville Area Chamber of Commerce (CACC) has surpassed expectations of popularity and profit with the annual Christmas Ornament Project. This fund-raising project allows the CACC to be one of the few Chambers in the province to reach self-sufficiency. The Ornament Project showcases local, talented artists with the superb opportunity to attach their names to this popular collector’s series, increasing exposure for their passion, art. For a retailer close to you please contact 1-866-466-5800. Caroling is one of the many ways to greet your neighbor and wish them good cheer for the holidays. 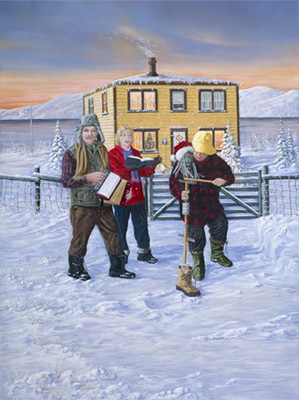 Although caroling is a centuries old tradition, it still exists in many of our Newfoundland outports and rural communities. Traveling from house to house, taking the spirit of Christmas throughout the town carolers sing and play. Whether it is the fiddle, accordion, ugly stick or the spoons Newfoundlanders love to entertain bringing atmosphere and sparkle to the town. Depicted in this painting is the ugly stick, which is one of Newfoundland’s most unique musical instruments. Made from a mop and decorated with bottle caps or anything that will rattle, a drum stick is used to create a distinctive sound.